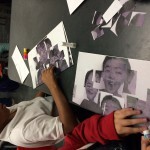 Design for Sharing , CAP UCLA’s free K-12 arts education program, has a long history of making the arts accessible for young audiences. 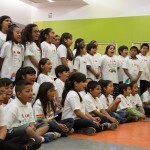 Using the arts to encourage creativity, learning and exploration , DFS offers professional performances and hands-on arts activities to public school students across Los Angeles. 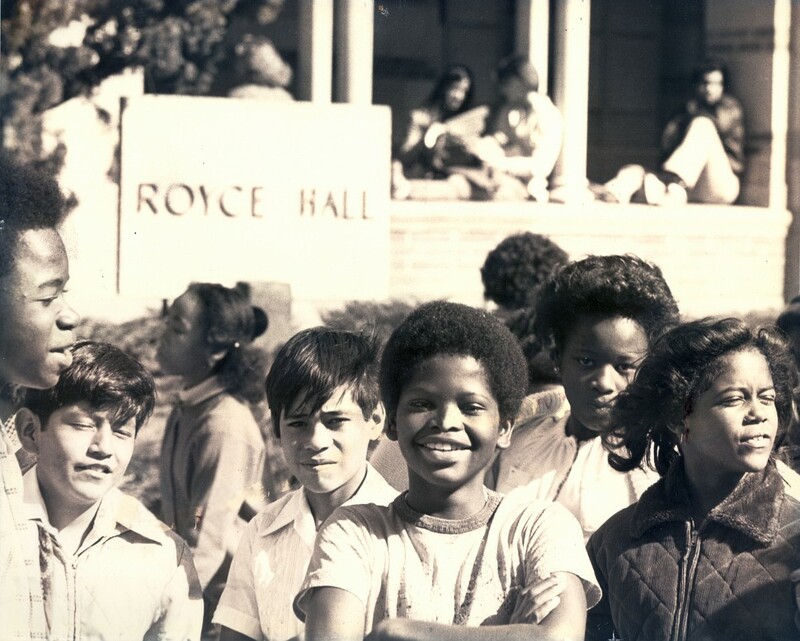 Since our founding in 1969, more than half a million students have experienced the thrill of a live performance in the iconic setting of Royce Hall. In 2008, we undertook a new project, hoping to give students an opportunity to go beyond the one-time experience of observing an arts event and become active participants in the creative process. Working closely with the faculty of the about-to-open UCLA Community School, we developed the Design for Sharing Residency Program: a 22-week series of in-class dance, movement, theater, creative writing and visual arts activities taught by professional teaching artists from Design for Sharing and local dance company CONTRA-TIEMPO. This year—the fifth of this successful partnership –we explored the theme “Pieces of Us”, asking 200 4th, 5th and 6th graders to consider the various roles we all play in our communities and what helps us to create our own individual identities. We began, way back in September, with simple exercises that encourage students to express themselves vocally and physically. We moved on to salsa rueda, a form of salsa danced in a circle with a leader calling out the steps. Later, students applied those skills to devise their own creative movement representing ideas culled from their weekly writing assignments. We have the power to choose! 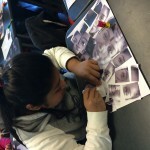 Students created collage self-portraits using varied photos of themselves and words from their poems. 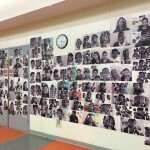 The completed self-portraits became the backdrop for their presentation. A few weeks ago, they had the chance to share these lines, and others at the program’s culminating dance and spoken word presentation. Our students gathered in a crowded auditorium, packed with younger schoolmates and smiling parents to present the poems, creative movement and salsa rueda they had worked on all year. In that setting, with creaking folding chairs and smartphone cameras clicking away, it’s easy to focus on the cute factor. Of course it is cute. Kids dancing and reciting poems are undeniably adorable. But it is important to remember that we have asked these students to do something that most adults struggle with: to think abstractly, express themselves honestly, and create a community where everyone feels safe enough to do so. We couldn’t help but feel a swell of pride as we watched our fifth class of Residency program participants dance their last rueda, moving around the circle like clockwork. The dance seems simple on the surface—the steps aren’t complicated, the caller keeps everyone on track—but a successful rueda demands that the participants, both individually and communally, choose to be fully present. That’s the foundation of human connection and the prerequisite for creativity. And it’s a lot harder than it looks. We do lots of cool stuff. Often with UCLA students and campus groups. Regularly with artists who change our lives as they pass through. And through our K-12 Design for Sharing (DFS) program (which began in 1969) every year we have incredibly rewarding moments with younger students from all over this city. 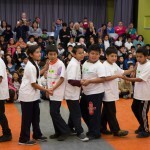 DFS events and initiatives ensure that experiencing art, making art and learning about art is a part of the lives of school kids from all over Los Angeles. We’re proud to say more than 14,500 public school students from across Los Angeles participated in DFS programs and activities this year. CAP UCLA’s DFS presented 11 Demonstration Performances, bringing public school students to UCLA to experience a diverse slate of art forms and artists in a live-performance setting. 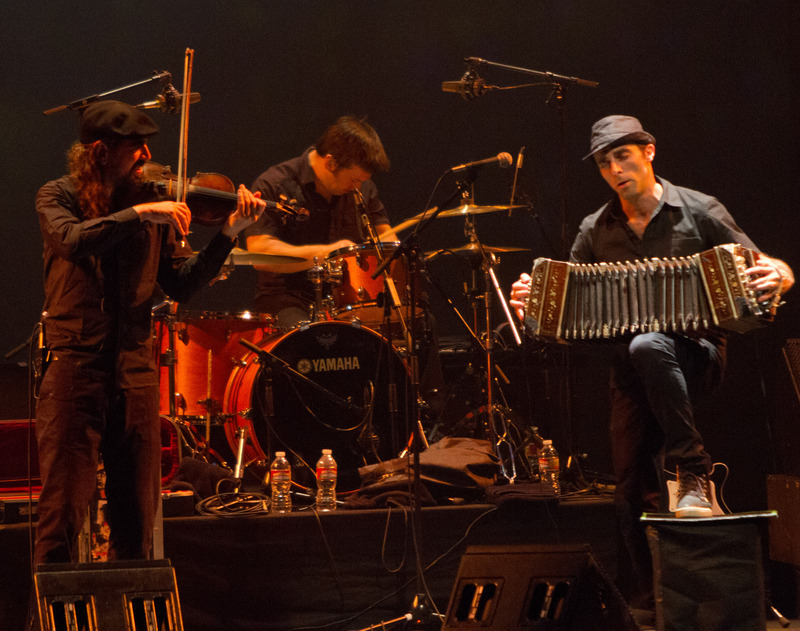 Some inspirational highlights include Bajofondo’s modern mix of electronic beats and acoustic tango from Argentina, which had our High School audience dancing in the aisles. Post-show, backstage, these amazingly generous and energetic performers were definitely feeling the love and effusive in their appreciation of the engaged student audience. It was one of those truly uplifting moments that just made everyone in the band and everyone who works here smile for the rest of the day. Bajofondo's Argentine style and instrumentation thrilled the DFS student audience. At one point, lead singer Ravid Kahalani brought out a lap-top and Skyped in his young daughter to be part of a performance for her peers. He panned the screen toward the audience who greeted her with applause and cheers. The cheeky Australian Circus Oz was a spectacle of unrelenting energy, humor, grace and strength. These performers, by virtue of their circus antics are naturally inclined to bring out childlike glee from audiences young and old, but their pre-show interactions with the students in the hall were pure joy to witness. 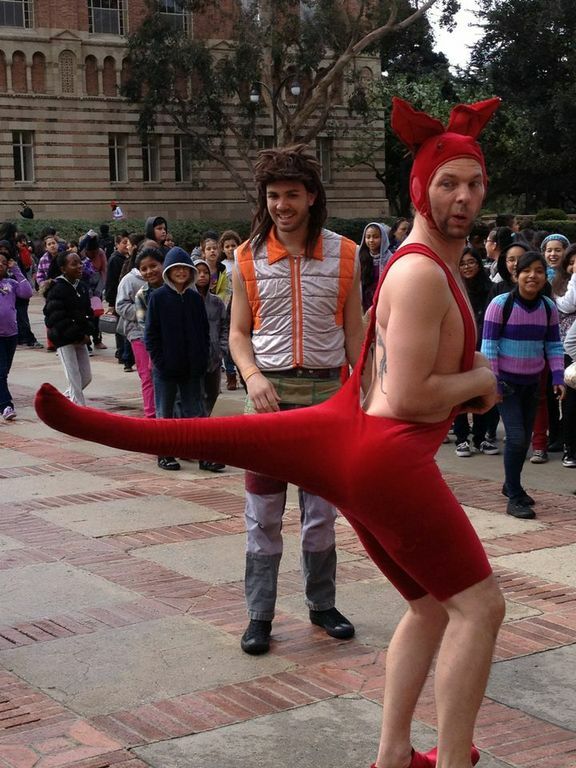 Nothing reverberates in Royce Hall like the sound of a thousand children laughing together. Circus Oz performers hamming it up with students lined up for the morning performance. And this group dedicated their performances to the concepts of compassion, community and celebrating diversity, something that completely resonated with the student audience. Back To Back Theater shared provocative, moving theater featuring actors with intellectual disabilities. The high-schoolers who attended this performance were incredibly gracious and fearlessly inquisitive during a post-performance Q&A with the artists. California-based AXIS Dance challenged our expectations of contemporary dance with their beautiful collaboration between dancers with and without disabilities. DFS also annually presents small-group workshops for the youngest elementary school students through the “My Special World” program. From Project Trio’s urban update of Peter and the Wolf to Dr. Craig Woodson’s global instrument-making program A World Orchestra You Can Build, nearly 1,000 students in second through fourth grades experienced the arts in an intimate, interactive setting. This year, we expanded that format to create intimate workshop opportunities for older students as well. At three of these new Performance Workshops, 240 Middle and High School students saw how professional artists create and rehearse new works, and had the opportunity to ask questions, learn new movements, and share some of their own work with dancers from CONTRA-TIEMPO and Akram Khan Company. We were also proud to partner with composer and music educator John Zeretzke to bring his Flutes Across the World project to three 6th grade classrooms. In a three-part series of activities at UCLA and in their classrooms, students learned about flutes used in various cultures worldwide and throughout history. Each student made a pair of twin flutes—one to keep and play, and one to send overseas with a Flutes Across the World Ambassador on humanitarian music missions for children in need in Africa, Haiti or Central America. Design for Sharing also continued our successful Residency Program at UCLA Community School. A collaboration between UCLA and Los Angeles Unified School District, the UCLA Community School is an urban education partnership that brings the university’s world-class resources to one of central Los Angeles’ most underserved neighborhoods. The goal of the DFS Community School Arts Residency Program is to give students an opportunity to go beyond the one-time experience of observing an arts event and become active participants in the creative process. Residencies are structured over a 22-week period and are taught by professional teaching artists who work in collaboration with classroom teachers. 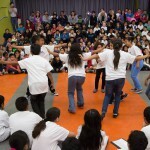 Teaching artists from Design for Sharing and CONTRA-TIEMPO worked with 200 fourth, fifth and sixth grade students. Students, teachers and teaching artists learned to respect and value each others’ unique creative voices. Participants wrote honestly and beautifully about what they believe in, what they stand for, and what they want, need and strive for. This was the program’s fourth year, and we’ve been thrilled to watch this group of kids blossom into creative, thoughtful and empowered young scholars and creators. The final presentation of their dance and spoken word performance pieces warmed our hearts and brought a few tears to our eyes. 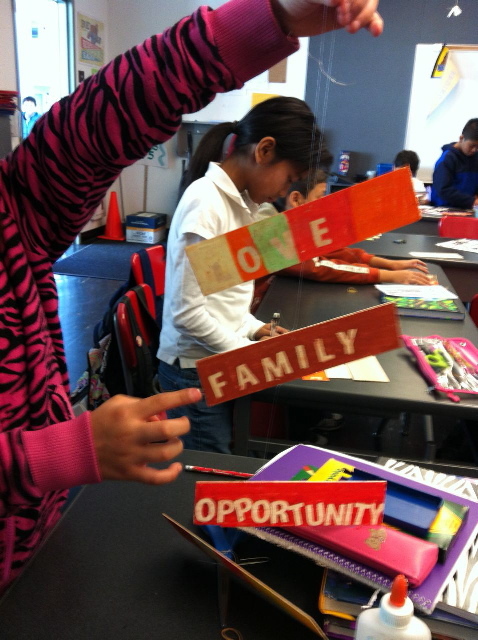 Students took their writings and distilled the ideas into a few simple words and phrases that became these amazing and inspirational mobiles. 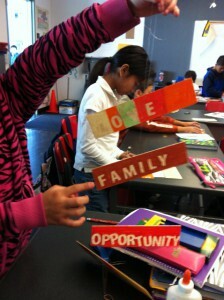 Community School students work on their We Stand Up mobile projects. Design for Sharing’s demonstration performances, workshops, residency program and bus transportation is only made possible through the generous contributions of individuals, foundations and corporations. CAP UCLA is supremely grateful to our stalwart supporters who have helped to make the 2012-2013 season happen. Part of making all this happen is making sure the students can get to the UCLA campus, a feat that’s harder than you might imagine! Thanks to continued contributions to DFS’ Perloff Memorial Bus Fund we were able to subsidize 132 buses for Demonstration Performances and 16 buses for My Special World/performance workshops, which helped more than 9,600 public school students get to campus. We’re incredibly grateful to the artists and donors who continue to support this program. We know firsthand it has an impact. This past season we were also thrilled to have an intern in our office who, during his elementary school years, attended DFS performances here at UCLA. Now he’s a student in the World Arts and Cultures department!